I got a glider style rocking chair on Gumtree for $15. A 12V garage door motor (almost identical to a wiper motor) was used to animate it. I’ll have to find (or make) a dummy for it and maybe dress it as a witch. 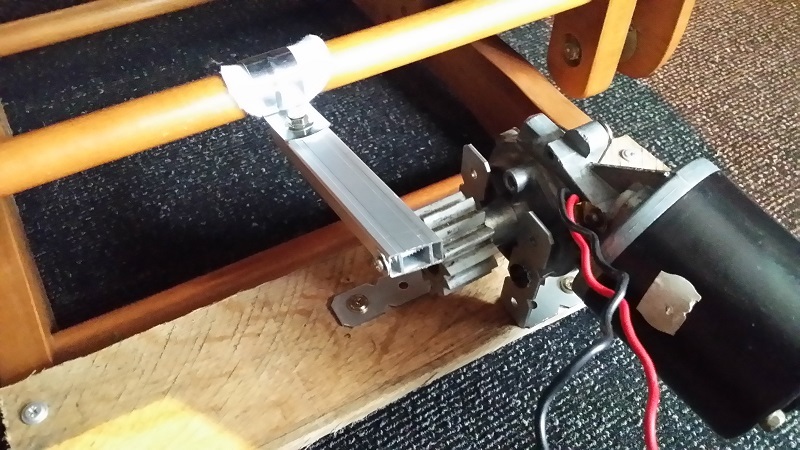 A few screws, scrap aluminium, pallet wood and a 25mm conduit clip made up the linkage. I’ll make a better one at work as my tools and supplies are limited at home. Because the conduit clip needs to swivel a little, a makeup remover pad was added ! It allowed for a smooth action with no added noise. 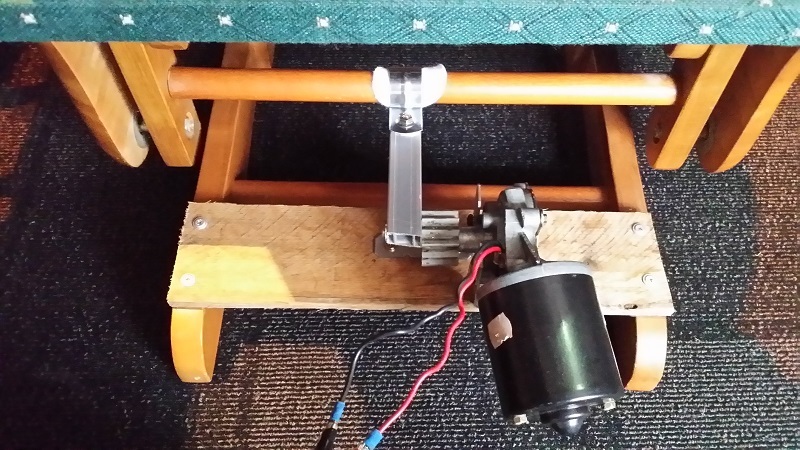 The chair will be in a corner so the motor should be hidden. A heavy cloth (not shown) draped over the motor reduces the noise. The temporary aluminium push bar was replaced. 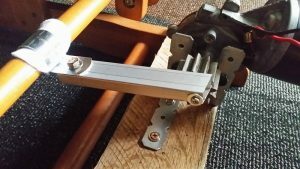 A plate across the gear let me achieve a wider arc. A new push bar was made from steel. Nylon washers flank the push bar at the swivel bolt. This eliminated the squeak due to the metal rubbing. 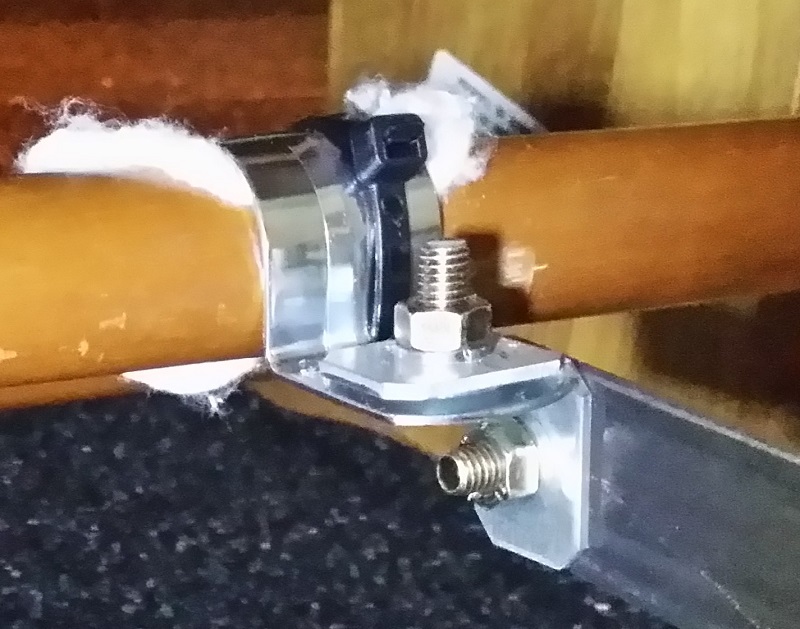 A nyloc nut allows for easy adjustment to get zero play. 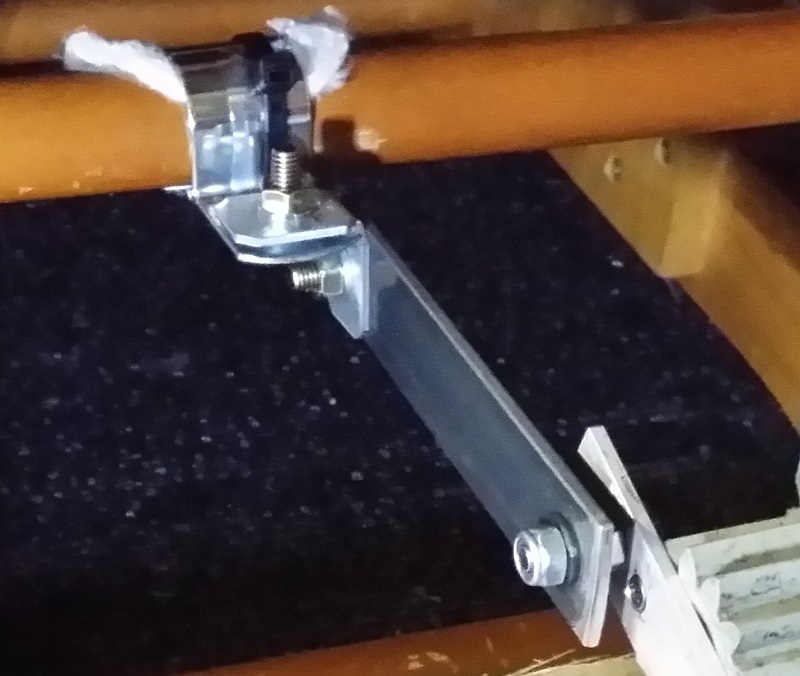 The conduit clip was cut and bent to fit the new bar. A cable tie stops the clip flicking off during the cycle. Running from 12V, the rocking action was a little fast. You can really hear the motor noise in this video. 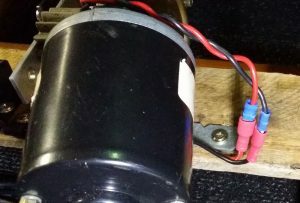 With the motor voltage dropped to 5V, the rocking action is more subtle and the motor noise is almost greatly reduced. The conduit clip that I bent to fit last time suffered metal fatigue after a few hours. This time I used a small L bracket. Closeup of the revised linkage. A 5mml hole drilled in the clamp allowed a cable tie to pass through. The cable tie stops the clip from working its way off during the cycle. The motor is much quieter running from 5V. 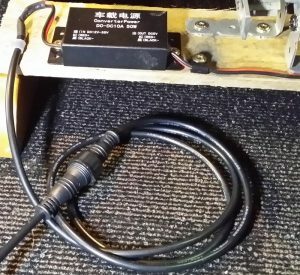 A DC-DC converter was installed to drop the incoming voltage down to 5V. 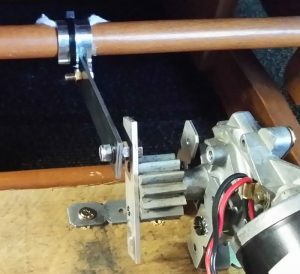 The output is rated at 10A, but the motor is drawing less than 2A. I could have used a smaller converter, but this one was left over and available. It’s not waterproof, but this prop will be under cover anyway. The converter allows the motor voltage to stay constant with the varying load. 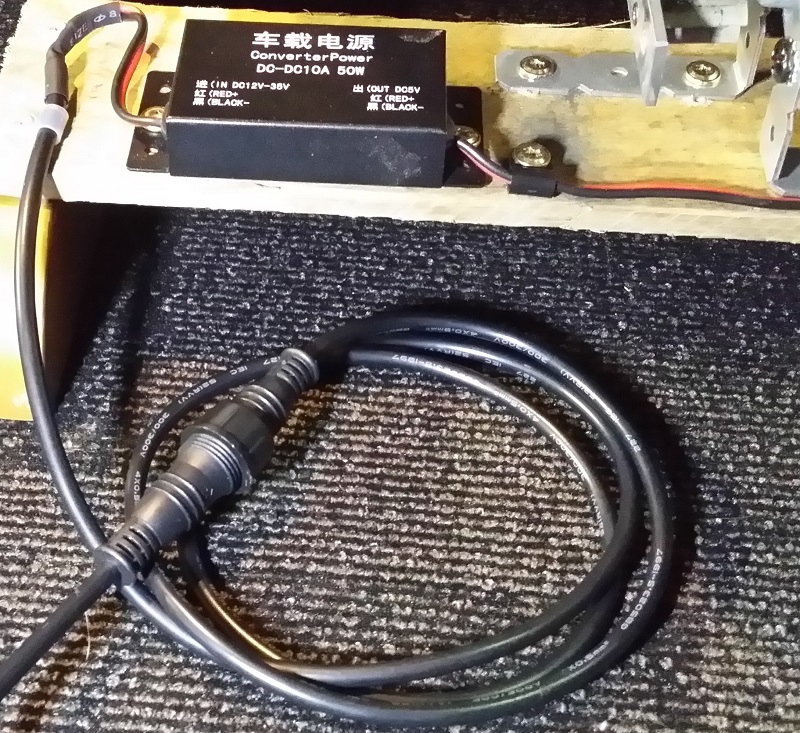 It will accept voltage in the 12V – 24V range and compensate for voltage drop. A cable tail with male connector is wired to the converter’s input. I like being able to easily connect and disconnect props. All wiring was secured (out of the way of moving parts) using P-clamps. Male 6.3mm QC terminals were put on the motor wires. The 5V feed from the DC converter has female 6.3mm QC terminals. This way the motor could be replaced without soldering. It’s worth taking the extra time to make your props easily repairable.